This recipe is rather an odd combination of flavors: sweet (pumpkin), spicy (sausage) and bitter (kale), but it works. 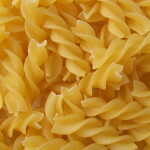 The original recipe uses campanelle (bell), but any curly or ridged pasta will work. It does not work well with flat pasta such as linguine, nor with spaghetti. This recipe is adapted from FineCooking.com (1). Although it calls for pumpkin, any sweet winter squash will work. I especially like buttercup squash – it helps to know how to tell when one is ripe (the button bulges out, full of seeds, when ripe). The pasta cited in the recipe is campanelle (bell), but you can use any other sturdy, preferably ridged, hollow-centered pasta. Penne or Fusili will work. Prep: Chop onion set aside. Peel and seed squash, then cut meat into 3/4” cubes, enough to make 1 cup. Trim kale, removing ribs, then cut into 1” pieces. Pasta: Bring saucepan of water to boil, then simmer. Cook sausage in skillet over medium heat, breaking it up into small pieces (if using links, remove from casings before cooking). Cook until mostly browned, 6 – 8 minutes; push to side of pan. Add olive oil if necessary. Add onion and cook until golden and sausage is well browned, about 8 minutes more. Stir in pumpkin, wine, garlic and marjoram and cook until wine evaporates, 3 minutes. Add half the broth and cook until pumpkin is tender, about 8 minutes. Add kale and remaining broth, cover and simmer until all is tender, another 4 minutes. 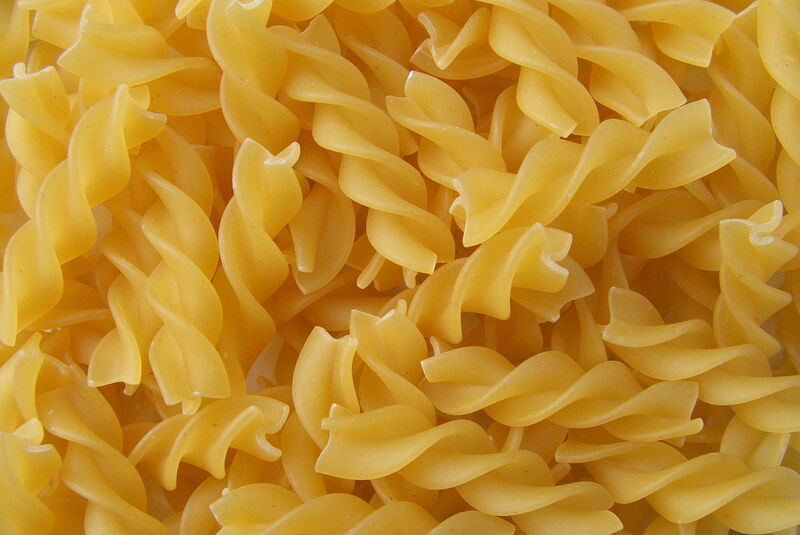 Cook pasta in boiling water according to package directions, to al dente. Reserve 1/2 cup of pasta water, then drain. Add pasta to skillet with enough of the pasta water to coat the contents generously. Stir in the grated cheese and season to taste. Serve with a green salad and balsamic dressing. 11/1 – 3/11: Made as written, except forgot to use just half of a 3/4 lb package of sausage and used the entire package. Will add more squash and kale to the leftovers to use up the extra. Used buttercup squash, which was delicious in this. I started with Sprouted Grain Penne, but didn’t like that flavor with the other ingredients, so picked all of it out and replaced with some bow-ties I had on hand. That was better. Result: This was quick and easy to prepare, and has an interesting mix of flavors: bitter kale, sweet squash and spicy (but not hot) sausage. Marjoram is a good herb in this, but I ran out of marjoram for the leftovers so used oregano. While this is not my favorite pasta dish, I will make it again – next time with proper amount of sausage, or perhaps may try this with chicken breast slices. This entry was posted in Alcohol, Boiled, Dairy, Herbs, Leafy Veggie, Onion family, Pasta, Sauteed, squash, Stock, broth and tagged cheese, chicken stock, garlic, Italian sausage, kale, marjoram, onion, pasta, pumpkin winter squash, white wine. Bookmark the permalink.